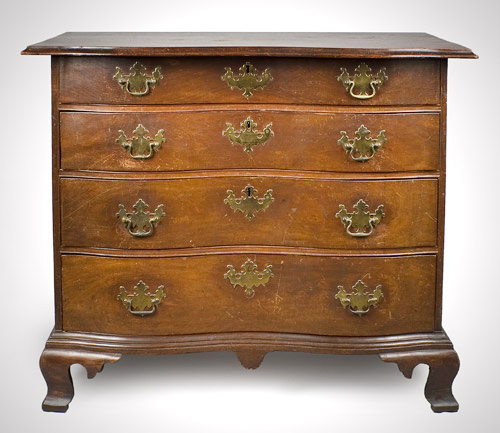 A carved serpentine front chest featuring a projecting top with molded edge above conforming case having four graduated cockbeaded drawers on a molded base; raised on boldly pronounced shaped ogee feet with shaped returns. 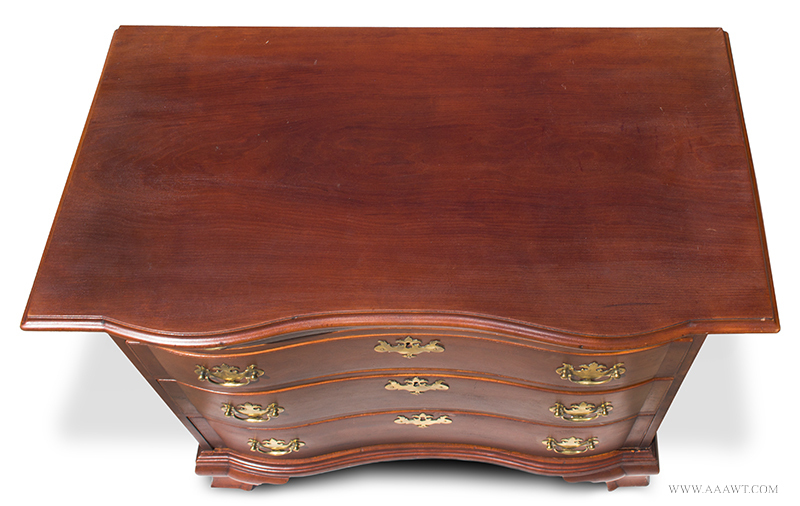 Dimensions: 32.5" H, 39.75" top W, 22" top D, 36.5" case W, 19.75" case D.
Dimensions: 33" high, 39.75" wide, 22.5" deep. 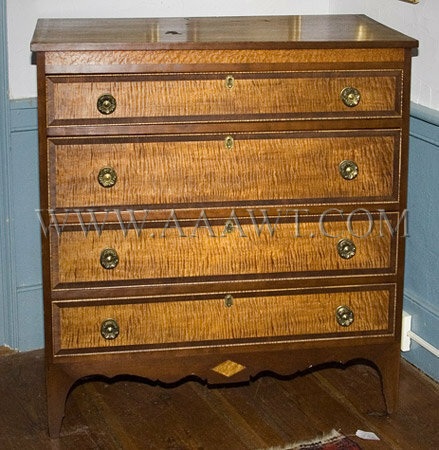 The frieze of curly maple veneer under the rectangular protruding top relates to chests made at coastal Massachusetts and New Hampshire. 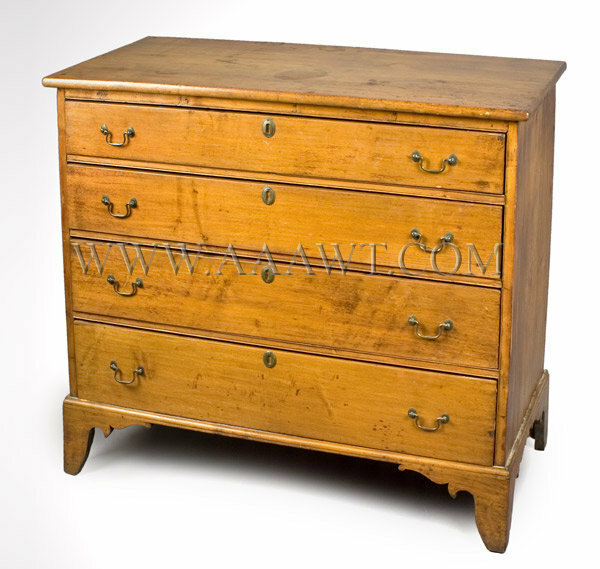 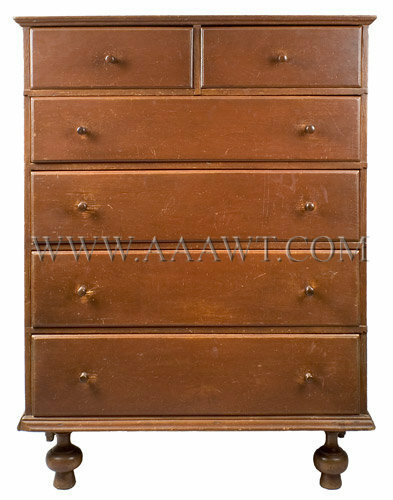 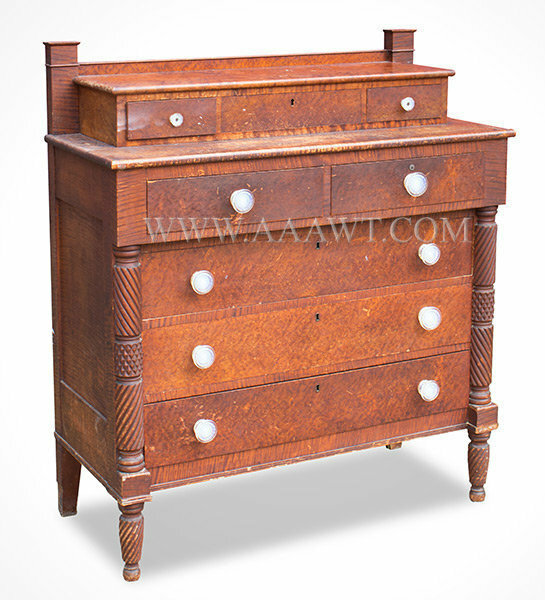 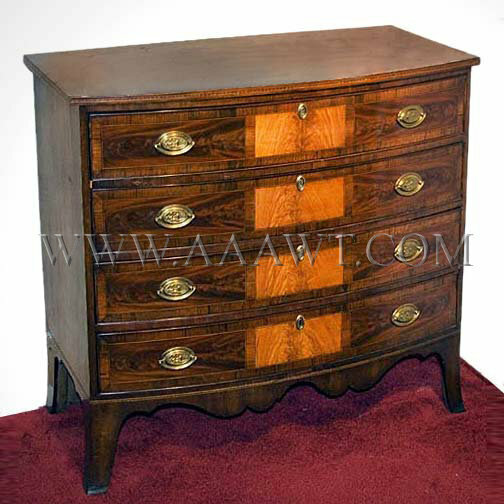 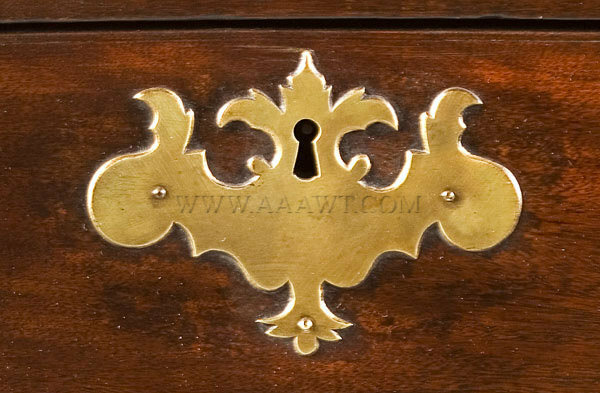 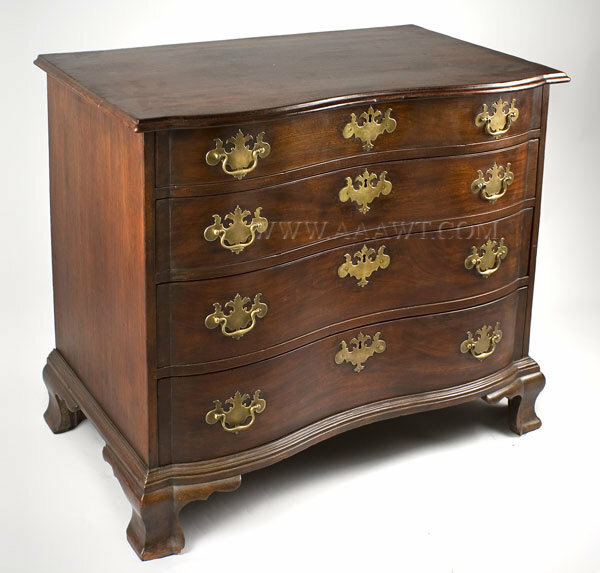 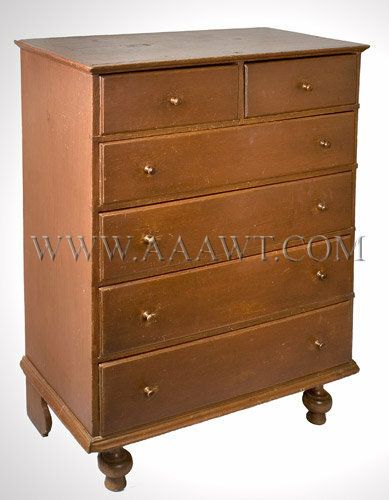 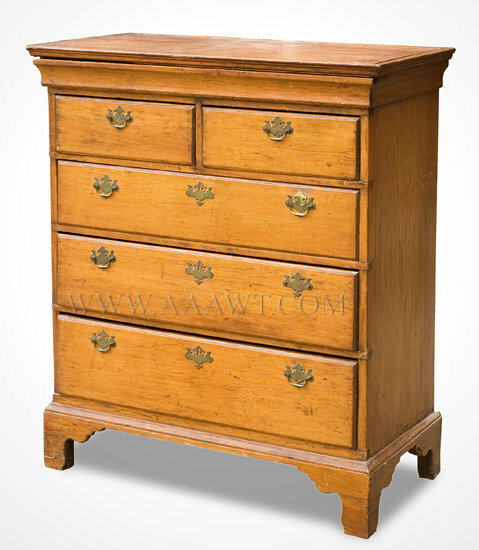 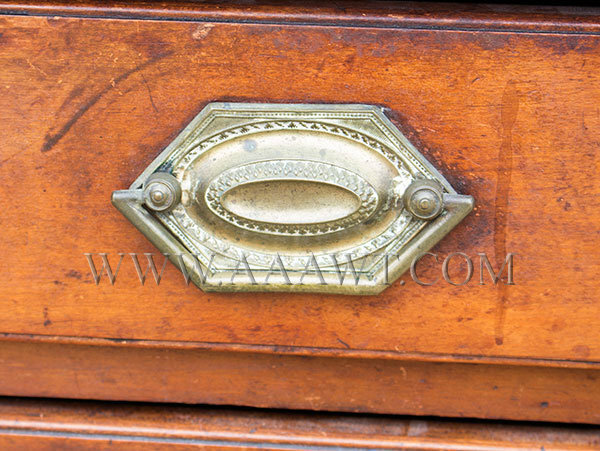 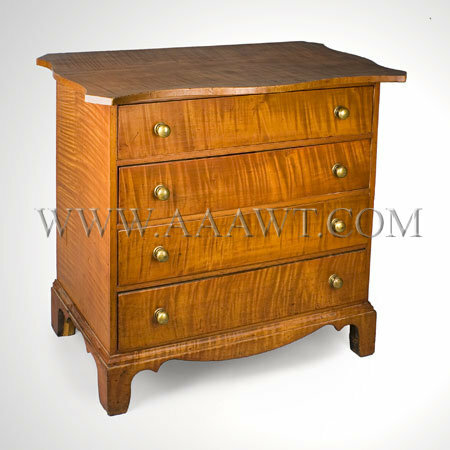 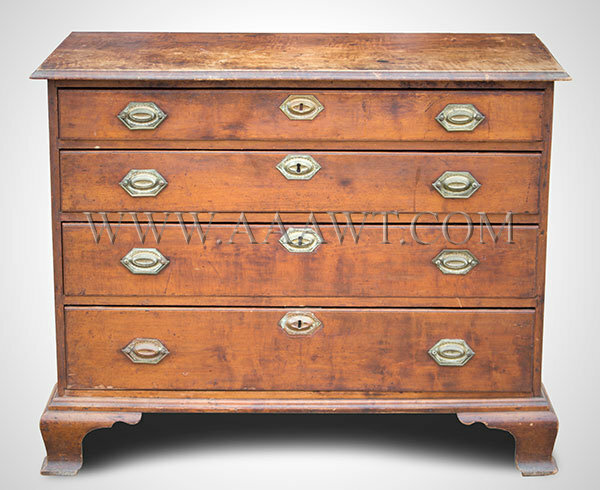 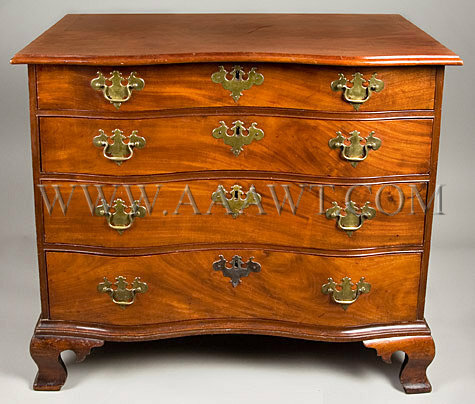 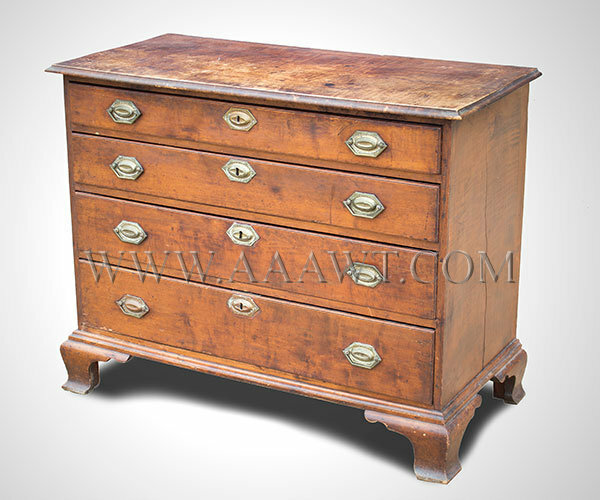 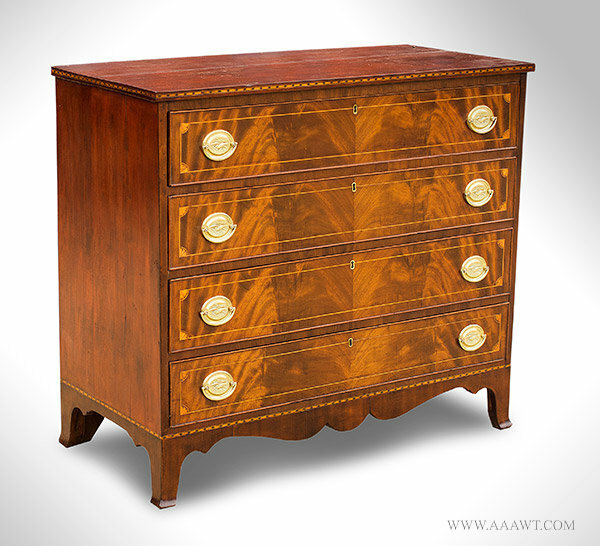 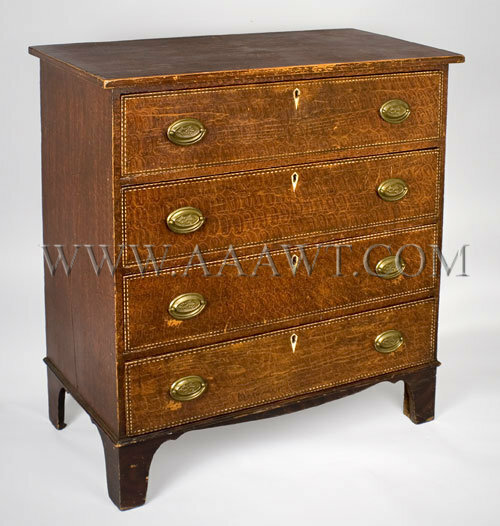 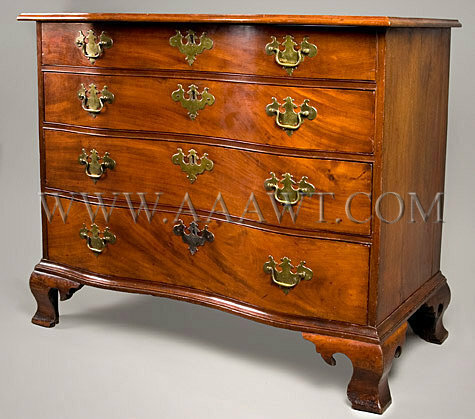 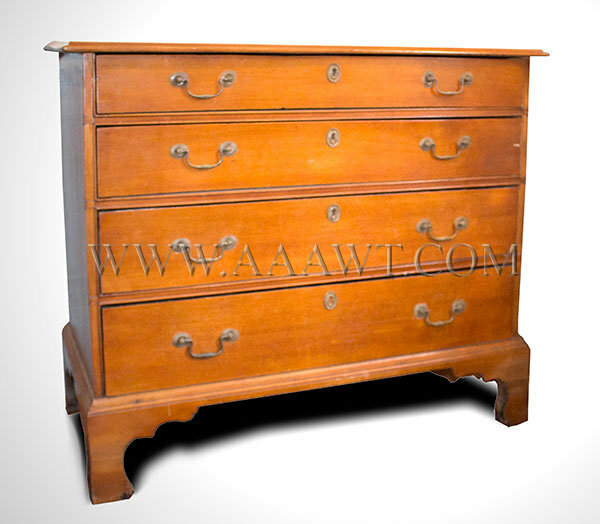 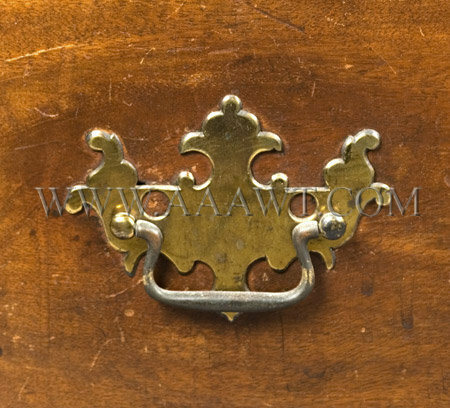 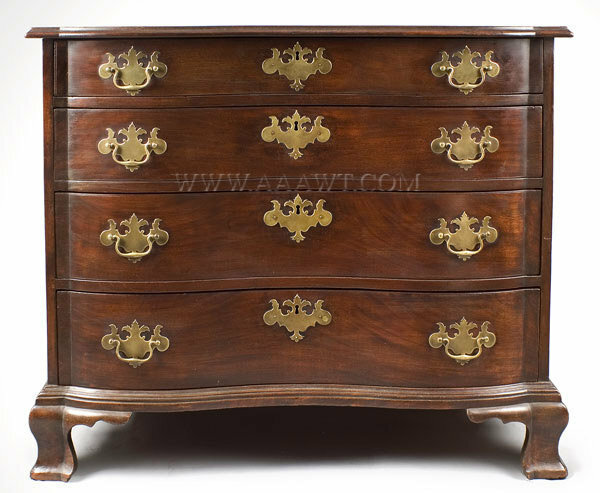 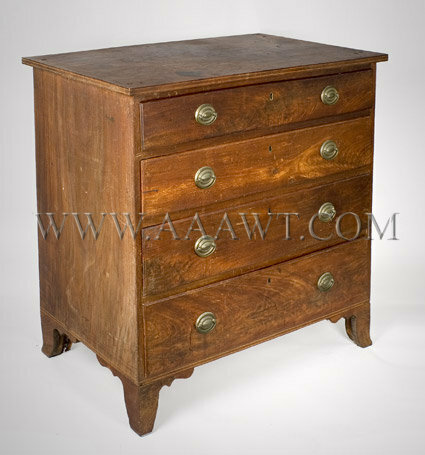 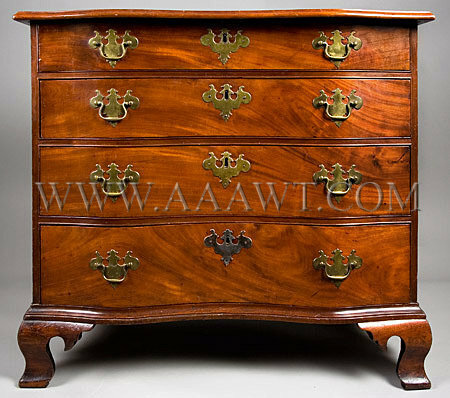 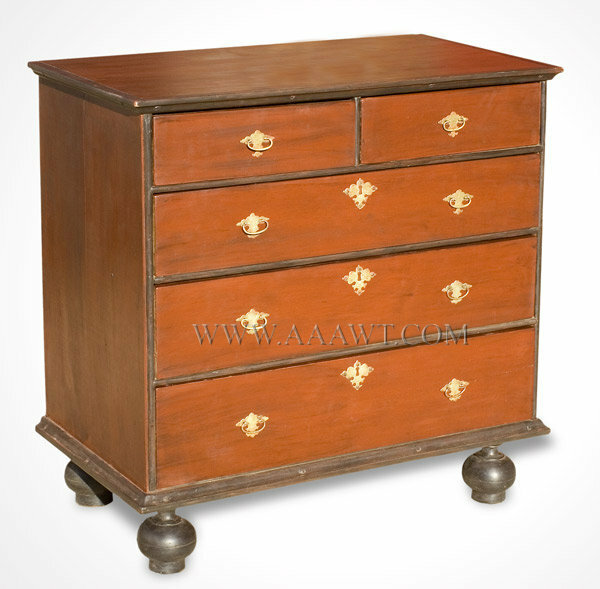 The overall shape of case, the shaped skirt profile and diamond shaped cartouche within drop panel and flared front feet are similar to chests made in New York State. 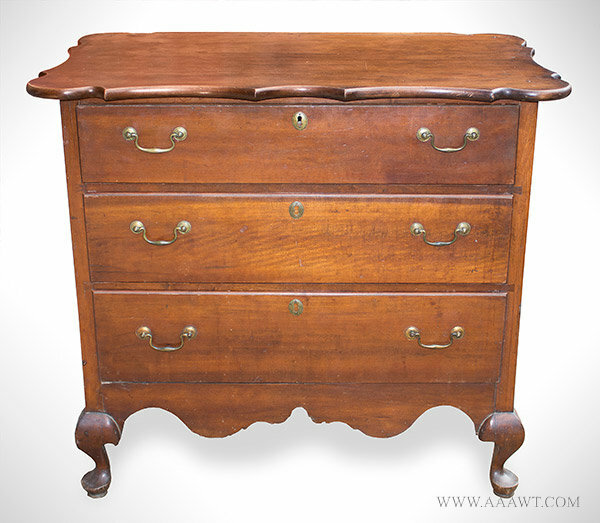 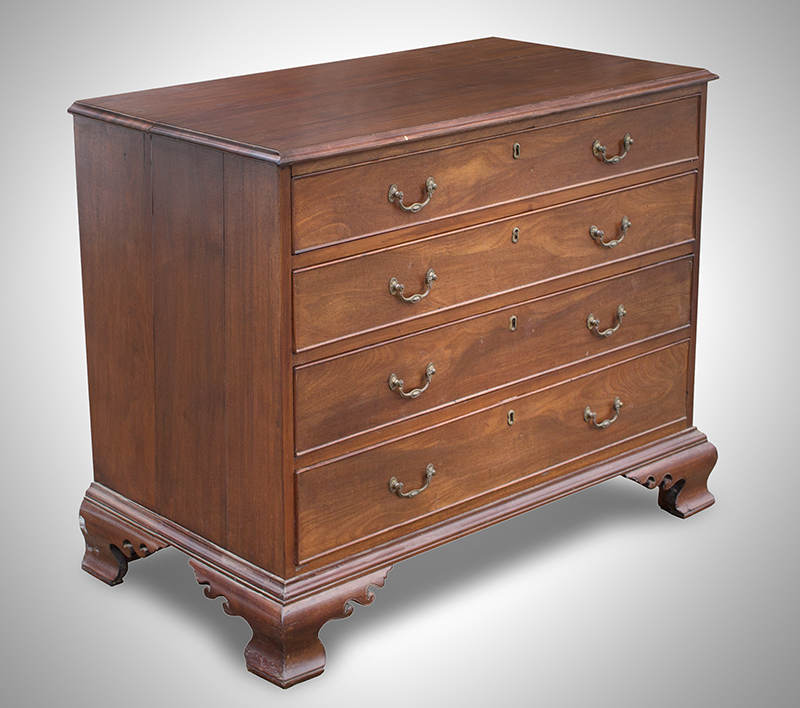 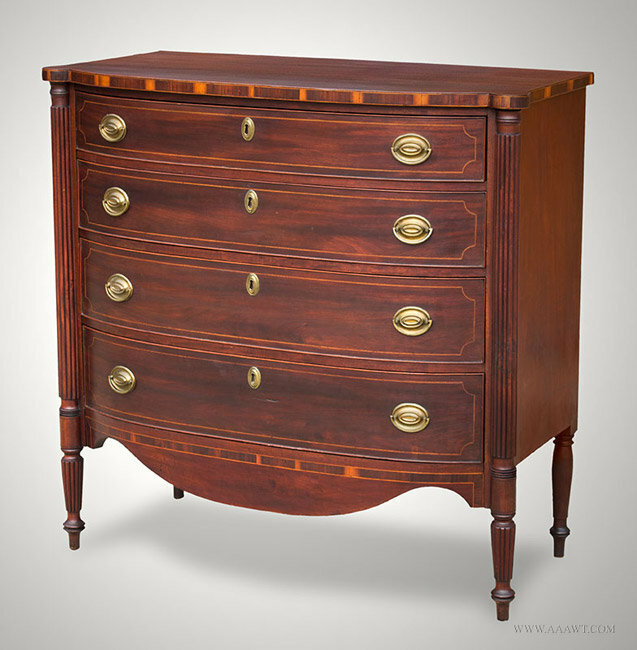 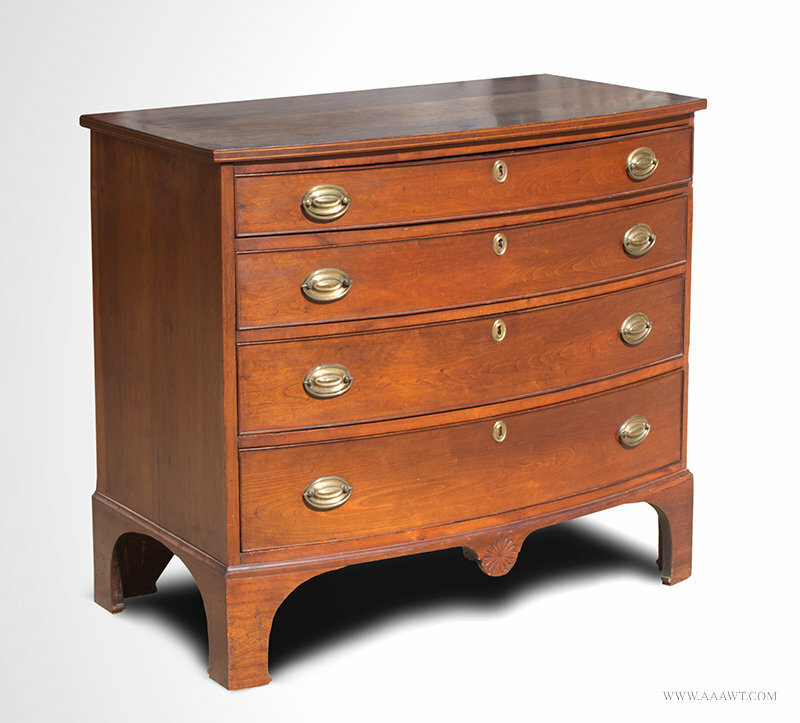 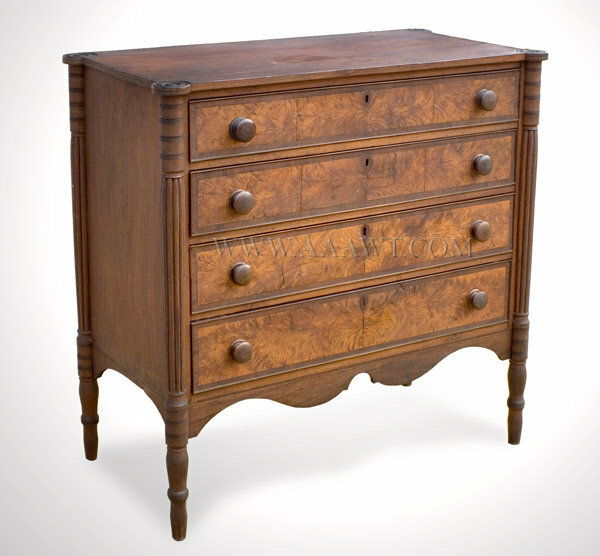 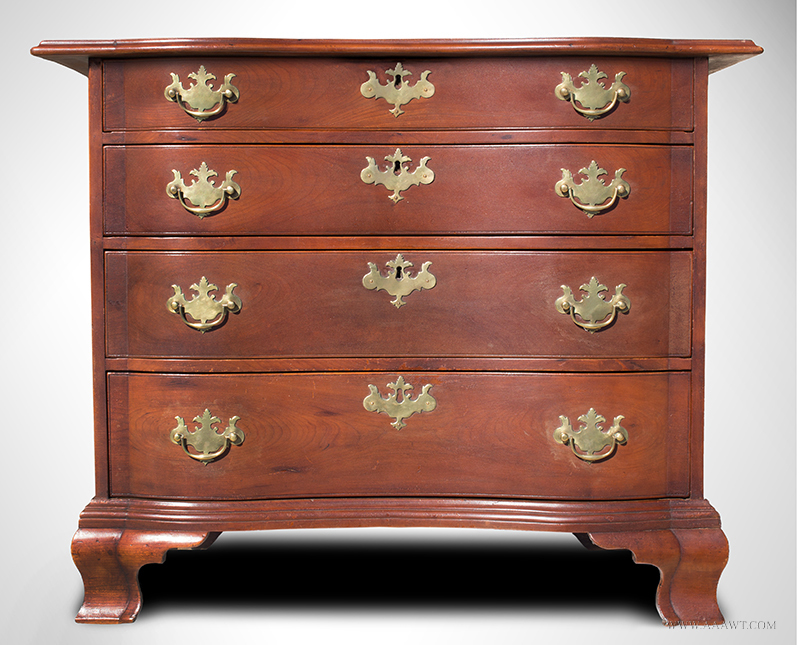 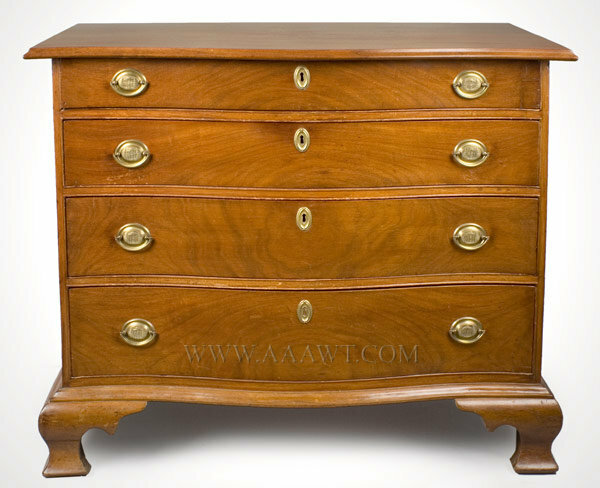 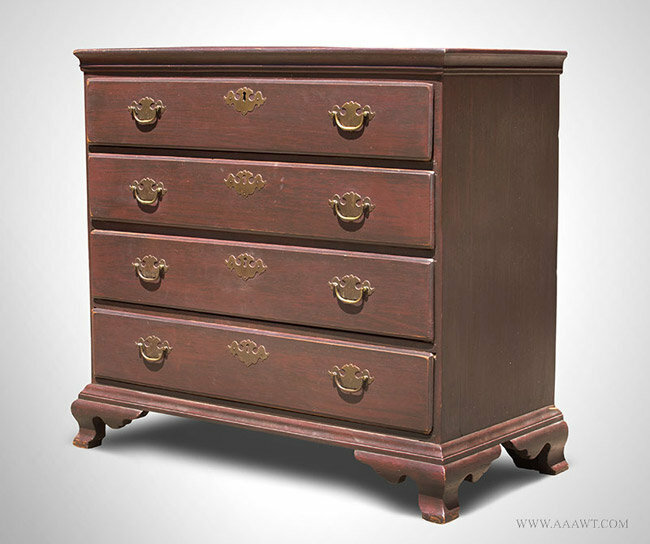 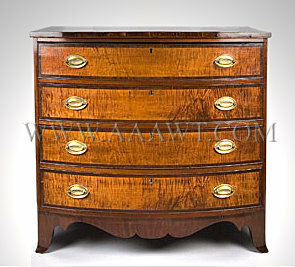 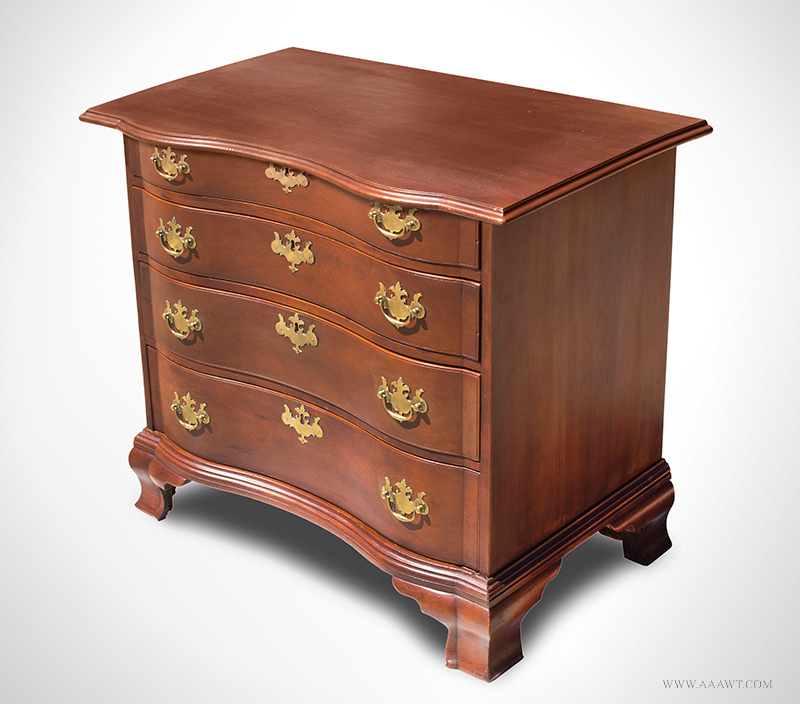 The molded serpentine top over conforming cockbeaded chest of four graduated drawers on four outstanding scrolling ogee bracket feet joined by a straight skirt. 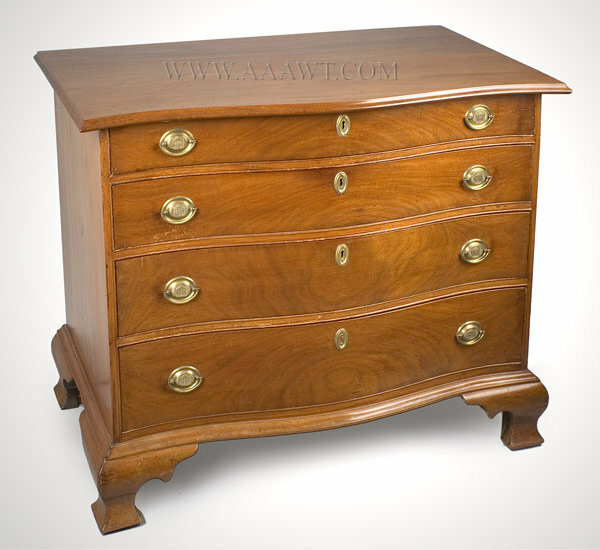 Molded serpentine top above a conforming case fitted with four graduated drawers raised on high, well carved claw and ball feet. 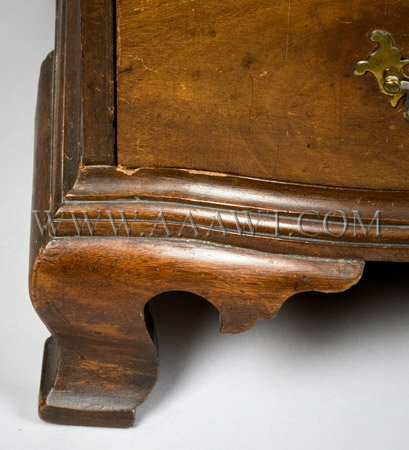 Minor imperfections (about 4" of top molding at rear restored) brasses are replaced. 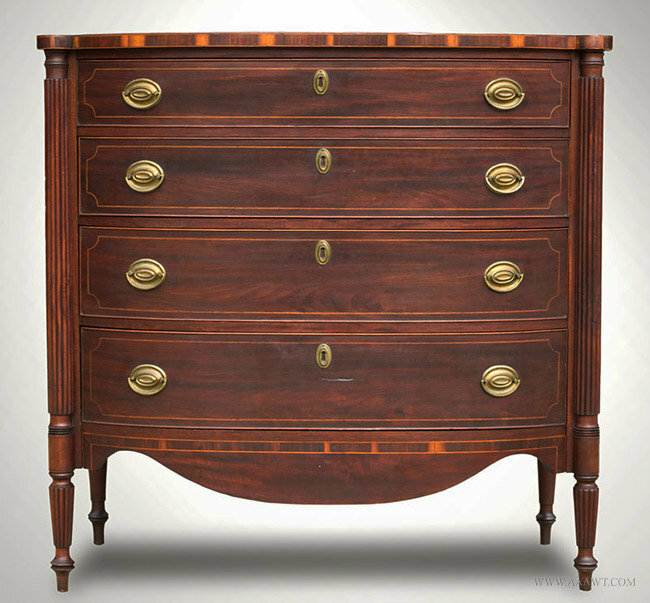 The top with sting-inlayed edge and ovolo corners turned with concentric rings is above ring turned and tapering fluted-columns centering four drawers each ornamented by magnificently grained book-matched birch veneer within mahogany banding and applied bead moldings; inlaid shield-shaped keyhole escutcheons. 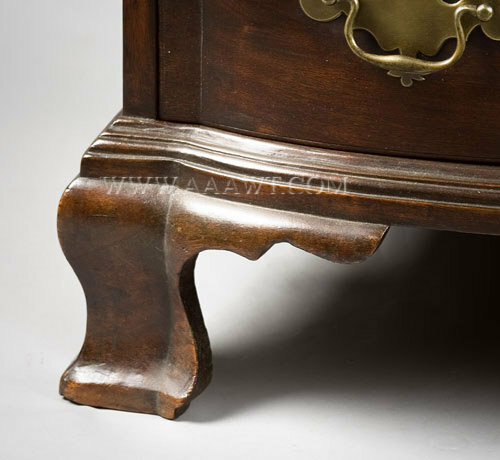 The case is raised on turned legs joined by undulating front apron and arched side aprons. 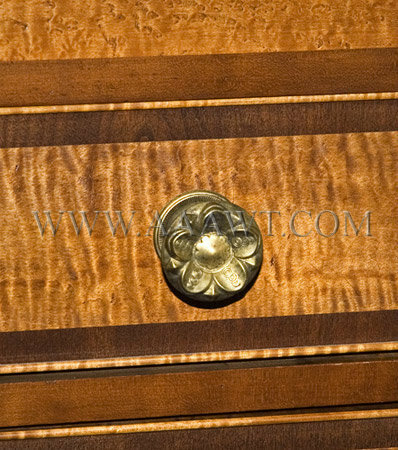 All aspects of this chest, including surface are original except turned wood pulls. 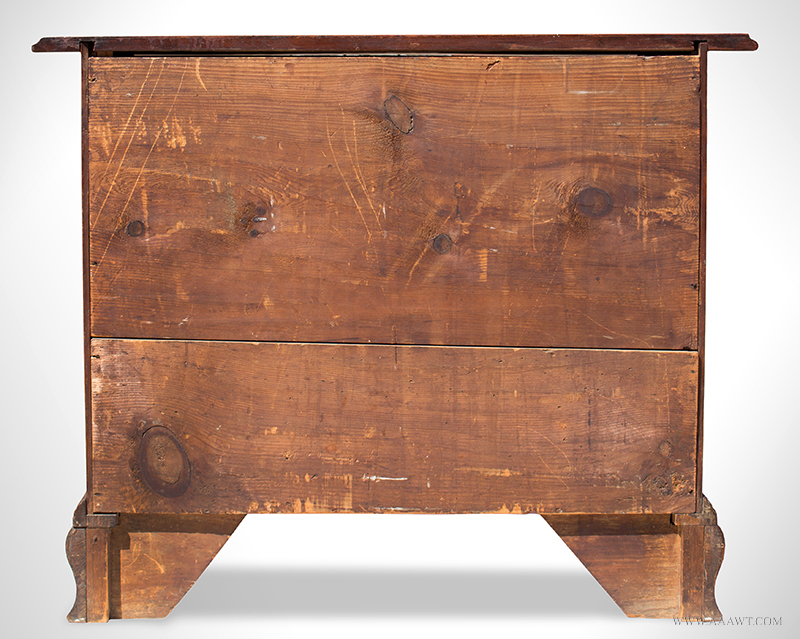 This table is related to a cohesive group of furniture that remained in the Bachelder and Sanborn families, their ancestral homes only three-miles apart. 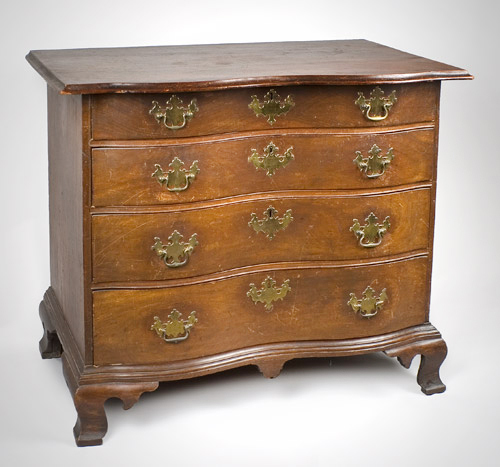 The Emery shop was located five-miles from the Bachelder and Sanborn homes. 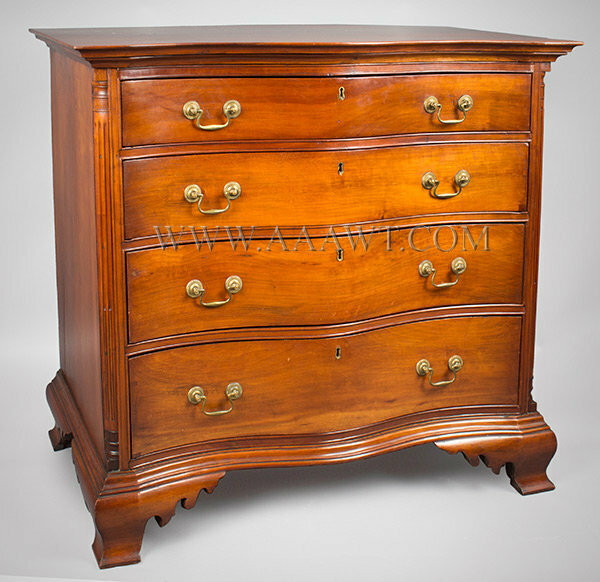 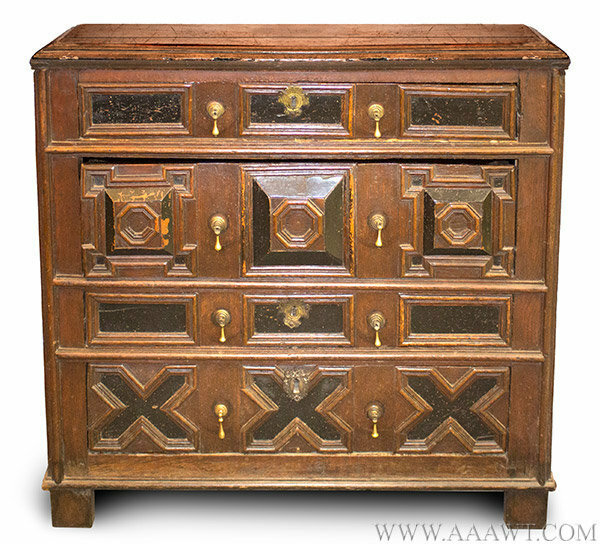 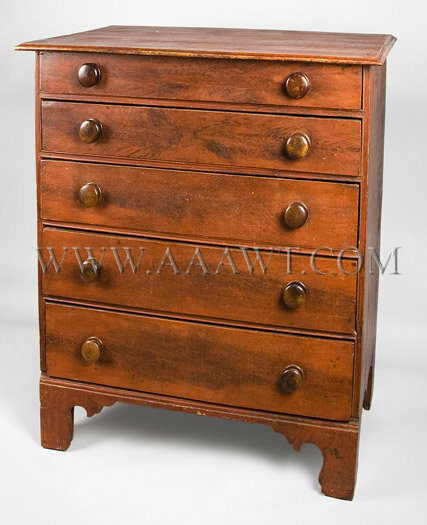 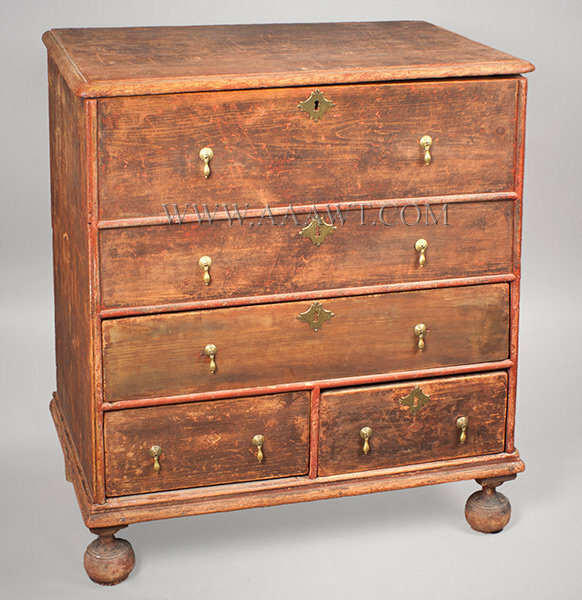 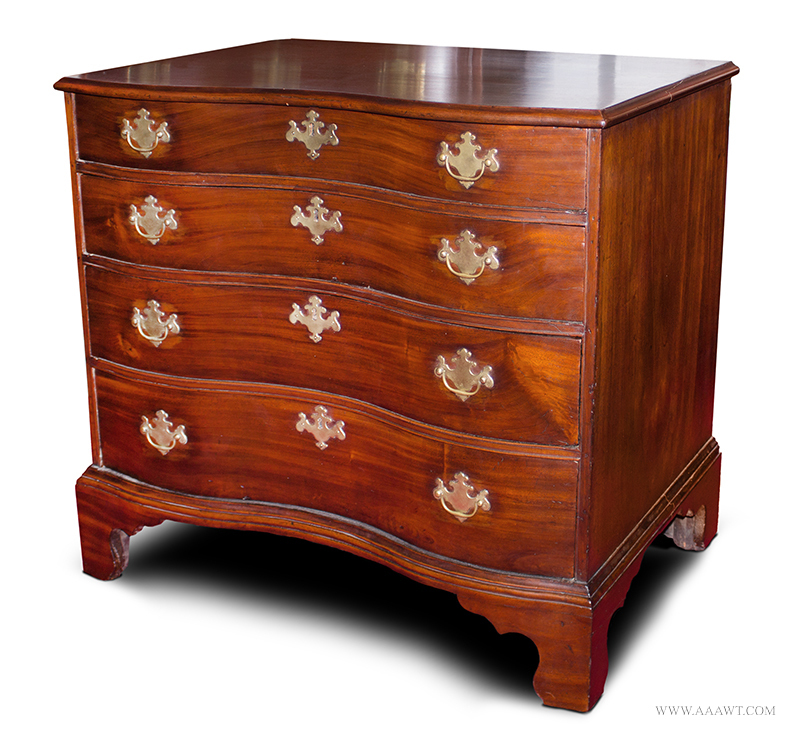 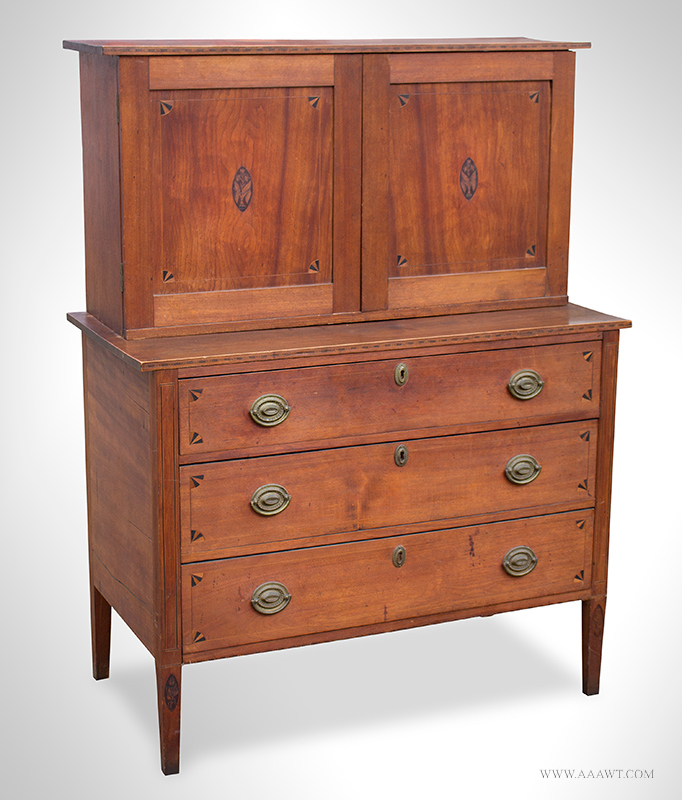 (Other information available) Dimensions: 40.25" H, 42.25" W, and 21" D.
Serpentine-front chests made in Connecticut are rare, and only a few examples, including the present example, feature quarter columns with stop fluting. 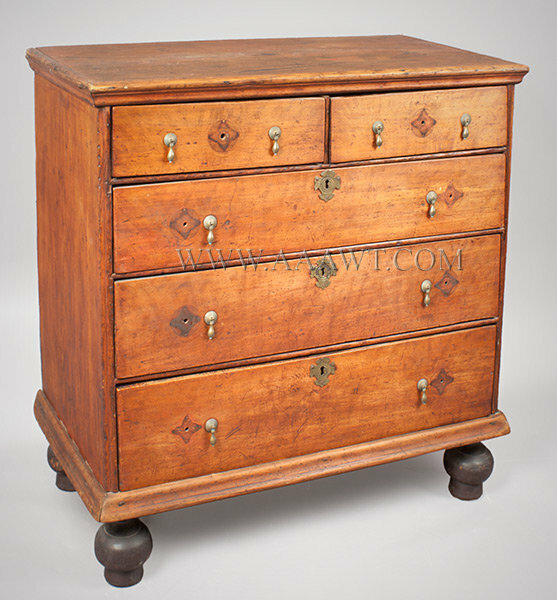 A nearly identical chest is illustrated and discussed in Minor Meyers, Jr. and Edgar de N. Mayhew, New London County Furniture 1640-1840, pp. 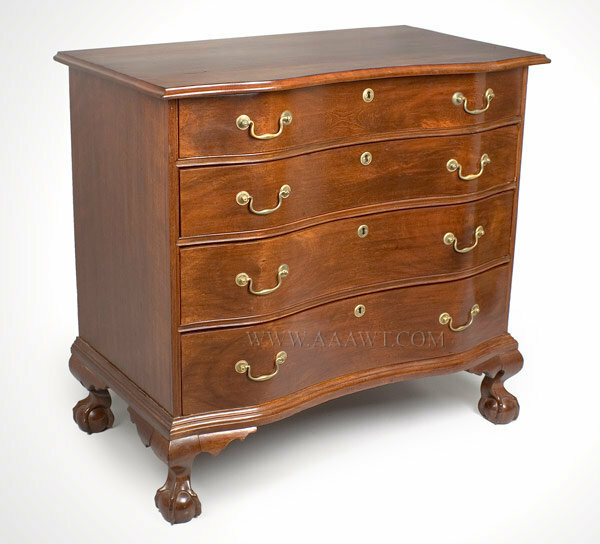 68 and 69, number 81. 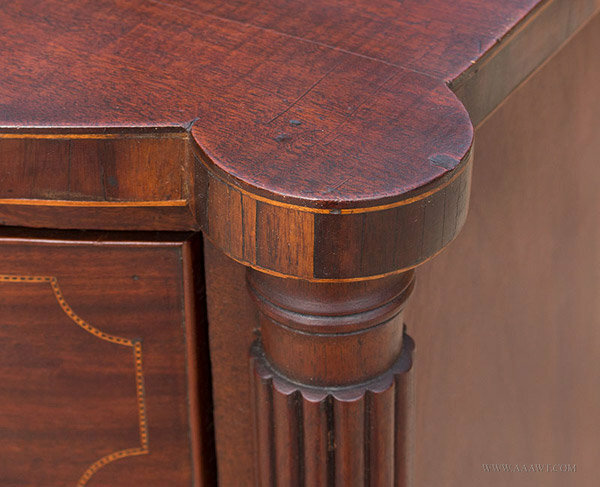 Another similar example, with the addition of line inlay to the drawer fronts, is published within Connecticut Furniture: Seventeenth and Eighteenth Centuries, page 42, number 71. 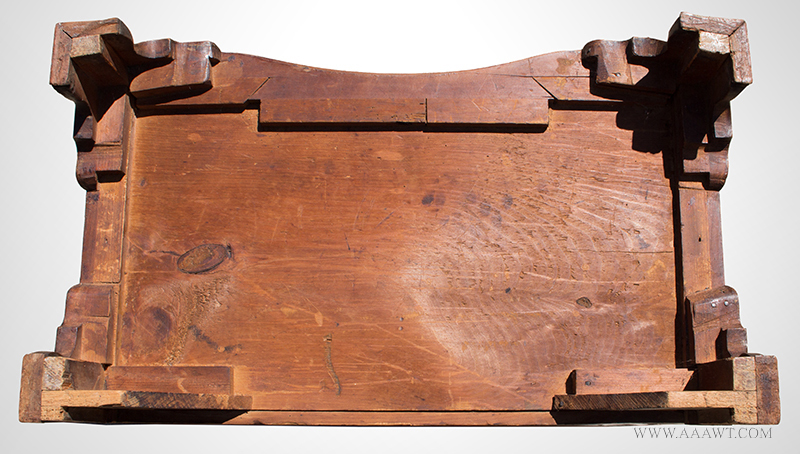 Measures 39.75" in height, 41" in width and 16" in depth. 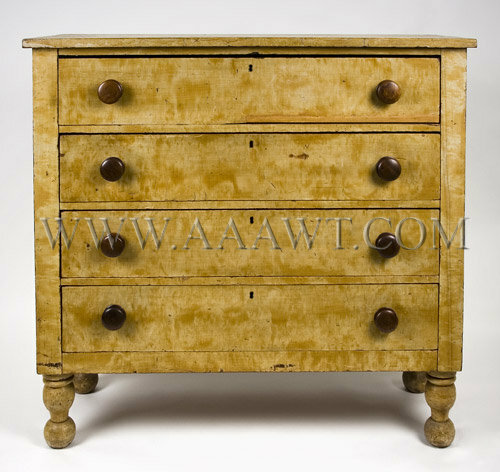 This yellow grain painted chest has some minor restoration. 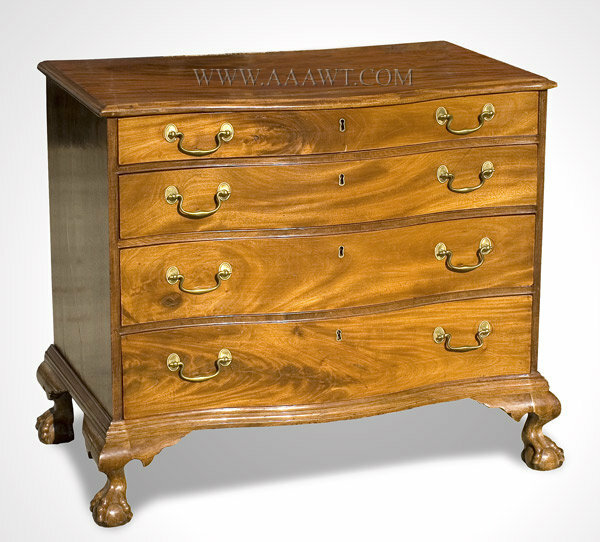 As depicted, three glove drawers above case of four long-drawers raised on turned feet. 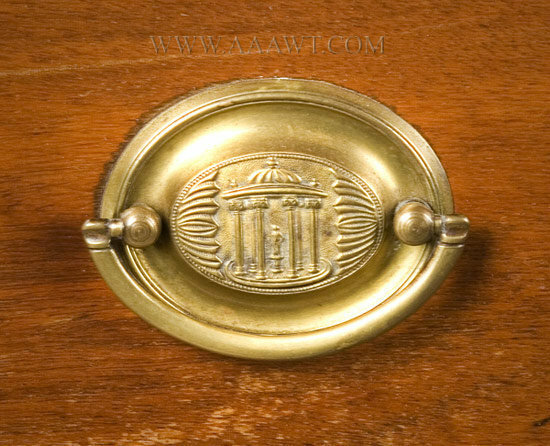 The yellow paint and brasses are original. 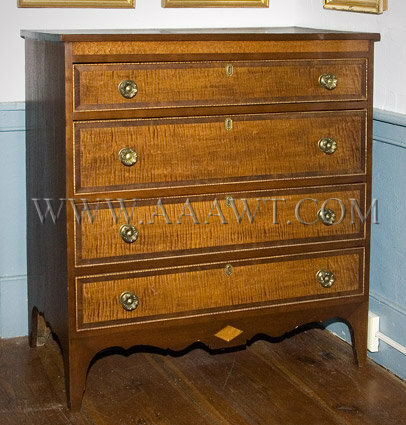 Dramatic crown molding with drawer above two short-drawers, above three long-drawers, all molded; the case raised on molded applied bracket base. 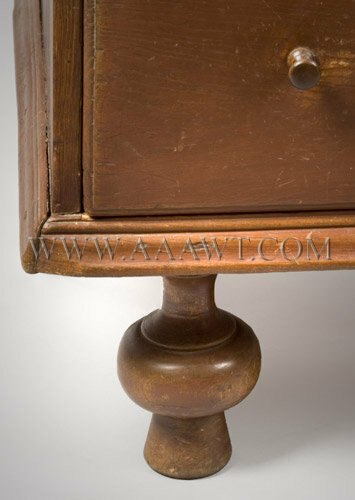 The case sides extend to floor with base profile conforming to applied brackets. 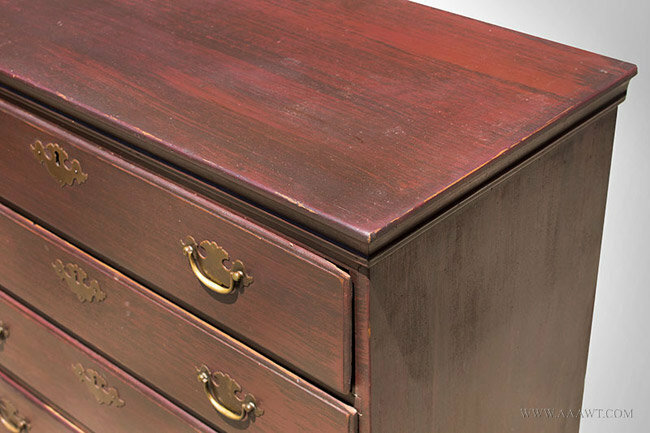 Very old refinish, minor imperfections including some "ending-out" of feet. 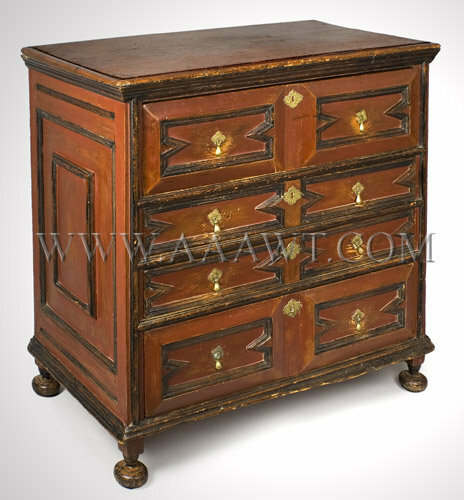 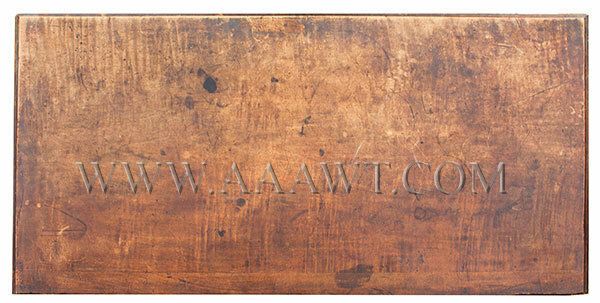 The overhanging top above a case of three thumb-molded drawers raised on tall French feet joined by apron featuring a heat cut-out. 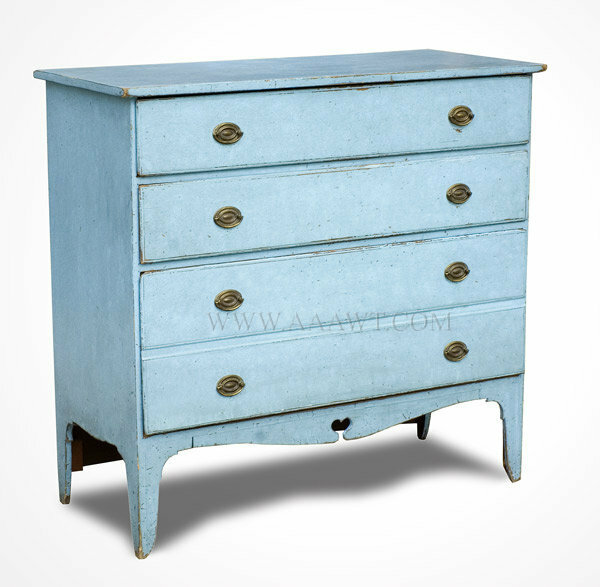 The showy blue paint appears to have been applied by a visionary before trendy, sometime during the twentieth century. 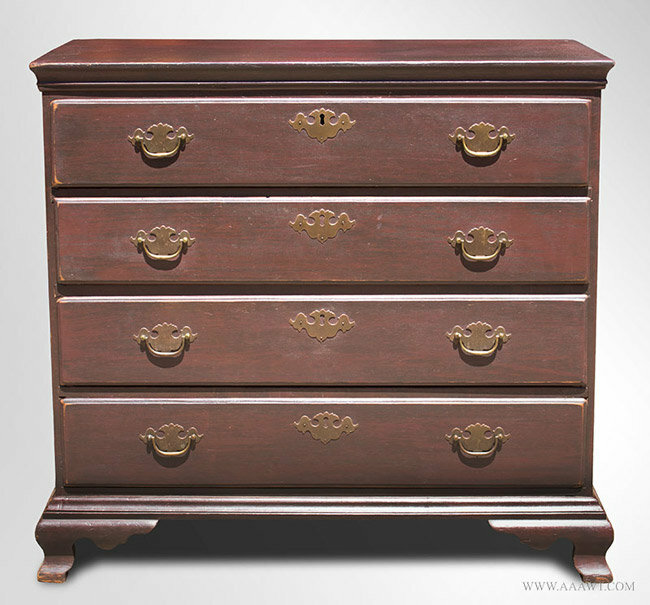 The chest is clean and very attractive. 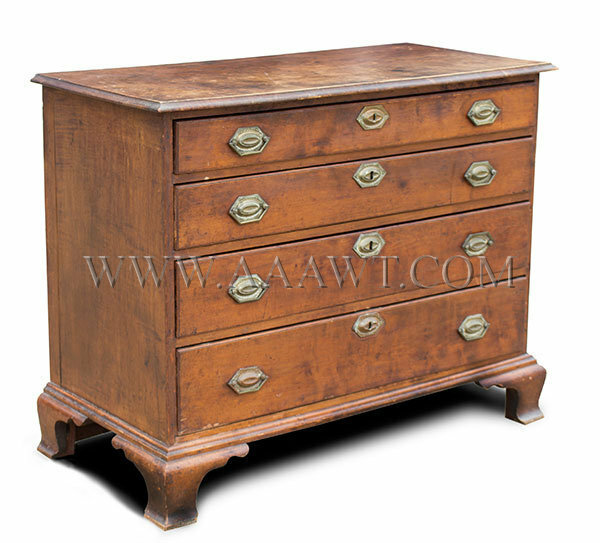 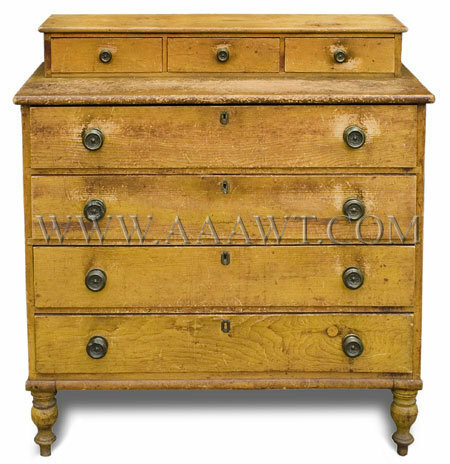 This four-drawer chest remains in a remarkably high state of originality; the moldings, drawer guides, backboards and feet are original. 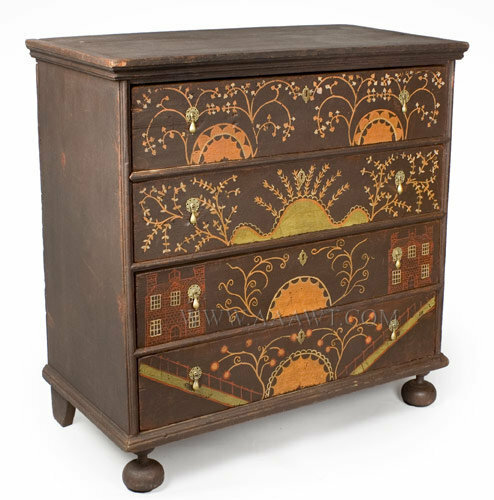 The painted surface and decoration (dry surface) is modern and was inspired by a small group of distinctive examples from Essex County.